As a result of adopting this new Ecoganic™ farming style, Frank measured many positive improvements in soil health and began to see a measurable increase in the number of creatures (and varieties of species) that chose to come back and re-inhabit the farm after a long, notable absence. These organisms, insects, reptiles, birds and other animals were previously unable to survive on our farm in sustainable numbers due to lack of habitat depleted by soil conditions. As the soil began to rejuvenate and revitalize, what we found is that many of these creatures migrated back to the farm in droves and eagerly began to pitch in to do their part to help grow our crops safely, sustainably and hearthily. Prior to creating our Ecoganic™ growing system, wasps had all but disappeared from our farm. Our farm now is home to five thriving species of wasps, the most interesting of which is a relatively unknown species called a paper wasp. 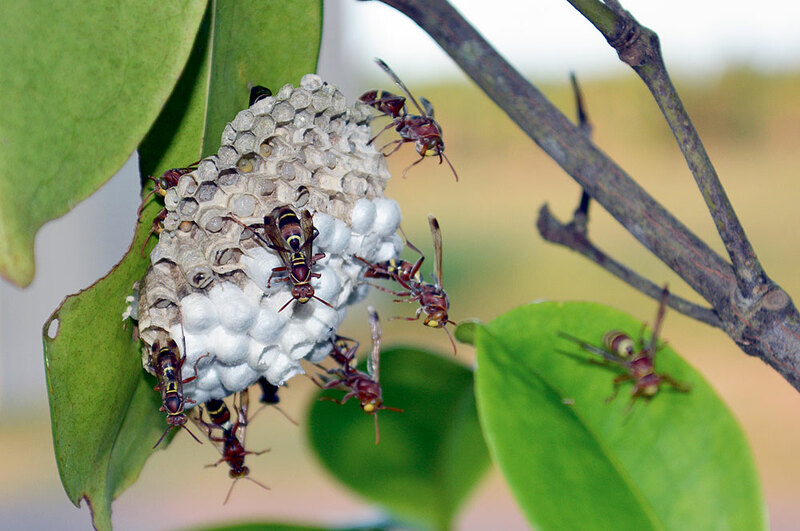 Flowering weeds that have been left out on purpose in the banana plantation have created a perfect food habitat for these wasps – especially during the hotter dry months of the year when their numbers peak. In addition to specific weeks, they also feed on a lot of pests such as moths. These particular wasps pack a strong punch. Our workers tread carefully around them because they have a nasty sting. However, they play a vital role in maintaining balance on our farm. Most people either hate or are afraid of wasps. To an Ecoganic™ Farmer, the wasps are essential workers because they replace pesticides that farmers would normally have to use to control pest insects. 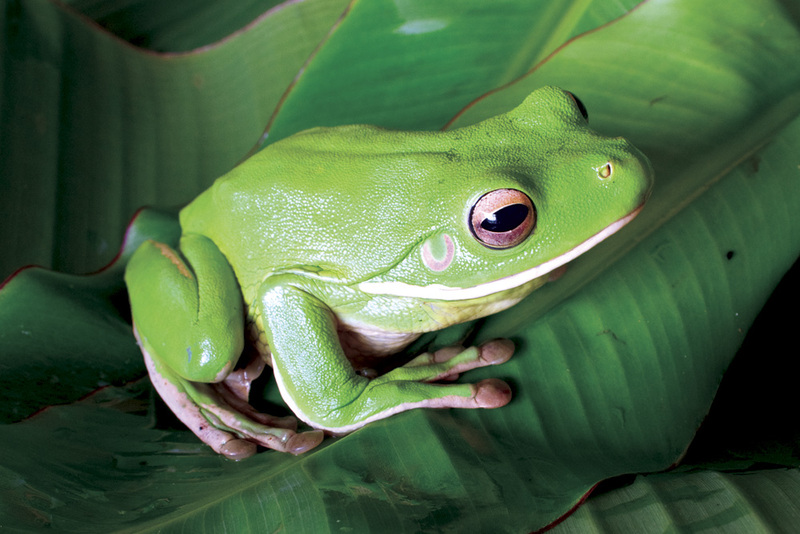 Frogs are very sensitive and do not tolerate unhealthy living environments. Where a lot of chemicals are used to manage pests and the soil is depleted, you will often find that frogs disappear completely. Frogs are extremely important to our crop as they are a good indicator of a healthy ecosystem. As part of the Ecoganic™ farming system, frogs collected from the harvested bunches are released back onto the farm. They are counted and we record other information such as climatic conditions so we can monitor and measure their behaviour and growing populations. This process has been a huge success as it has allowed us to support a strong and growing population of frogs on the farm and it helps our team to see firsthand how these amazing creatures are vital to the ecosystem. These unique beetles are beneficial insects that we like to see in good numbers on our farm because they eat pest mites that feed on (and destroy) the bananas. The blue shield beetle lives and multiplies in record numbers (especially in the spring) because we provide a healthy and safe home for these great workers. If we used insecticides on our soils and trees (they way that we did when we were farming under the old traditional methods) they simply would not be able to survive at all. 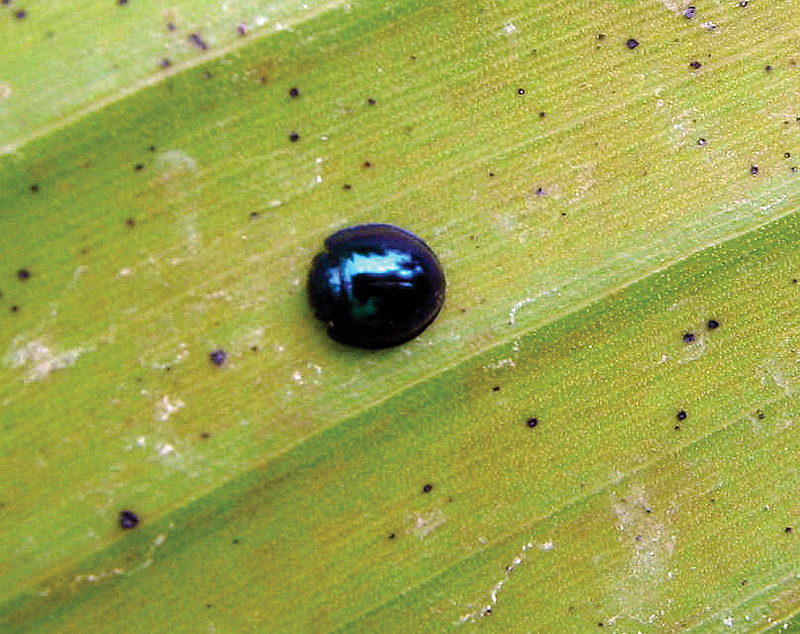 They may be a tiny and unassuming little beetle, but in healthy numbers, they can control our spider mite problem and ensure a healthy crop of Ecoganic™ bananas. 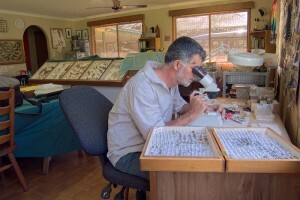 Over the years, our monitoring shows we have a complex diversity of insect species. When we look at all of the various species in the insect category, the ants stand out in terms of sheer numbers and capacity to contribute to a healthy environment. Ants enjoy a complex community arrangement and survive quite well in our balanced ecosystem. As most people know, ants are very robust and persistent little creatures – if you’ve ever had them in your house you will know that they can be almost impossible to get rid of! However, in a farm environment, ants are a key indicator species for a healthy environment as they play a crucial role in maintaining balance. They eat and control a large number of destructive pests and they are very effective at the role they play because of their tenacity and large populations. Insecticides that sterilize the soil are very effective in killing ants. That is one reason why we don’t use these products – we don’t need them because the ants we have on our farm are very effective in assisting the control of pests. Each night, we watch a large group of wallabies come down to the recycling pond to have a drink in the hot dry summer months. We have also helped to create a more welcoming home for them by planting trees as wind breaks and artificial wildlife habitats. 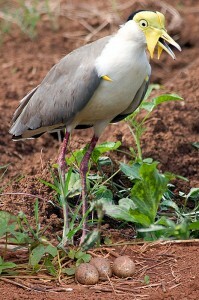 In particular, white and black Ibis have made these their nesting place at night. Before creating the Ecoganic™ growing system, wallabies were rarely seen on the farm as we used to use herbicides that eliminated the vegetation they needed for nutrition and shelter. Dusk is a very magical time on our farm. Hundreds of native birds fly in to land on the trees and sleep for the night. It is enchanting to see them, listen to their beautiful voices and know we have created a habitat that they return to for sustenance and safety each night. Regular monitoring of the insect population allows us to gauge the health of the ecosystem on our farm. Paper Wasps are essential workers because they replace pesticides that farmers would normally have to use to control moths and weeds. Frogs are very sensitive and do not tolerate unhealthy living environments. These unique beetles are beneficial insects because they eat pest mites that feed on the bananas. 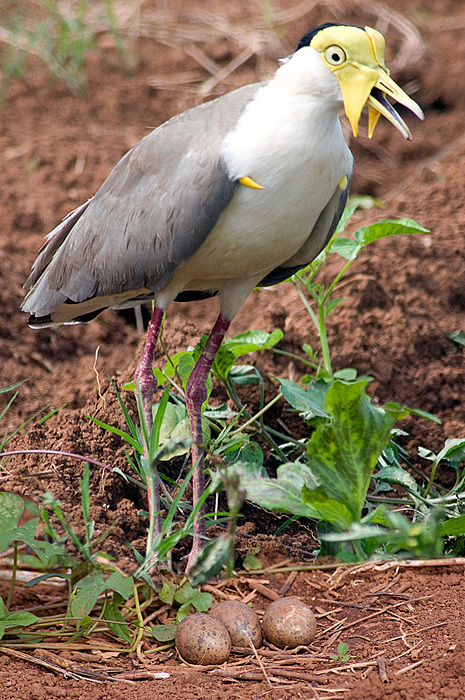 Masked Lapwing guarding eggs – photographed on Frank & Dianne Sciacca’s farm.